In my current state of Gopher, I’m trying to slowly bring my brain and heart back in to a creative mode. It’s hard. In the current chaos that is my brain, I want to swirl and swim. But that starts to feel like circling the bowl and I’m not quite ready to flush yet. So I have to get back to a routine here at home. Routine is good. Get up, make a cuppa, then get to the mess of a bead table. Mess is ok. I cam dig through it, unearth little treasures here and there that I had forotten about. Today I unearthed a package (or two) of goodies from Humble Beads that I had tossed on my table and forgotten about. An inky blue heart, swirled with translucence and wildness. A wild heart. I dog some more, unearth some drops and links I had intended for a long discarded project that suit this heart perfectly. 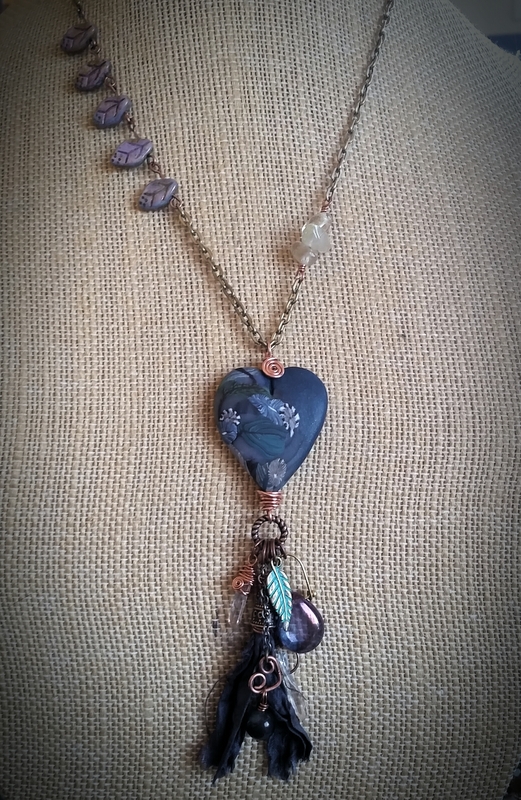 Iolite, Quartz, a tiny copper wire heart, Czech glass, some Rutilated Quartz, and a snippet of ink blue silk ribbon that came along with the heart.